With a robust stainless steel design and lift off lid, this powerful deep fat fryer from Buffalo is a great value, high output solution for small to medium sized catering businesses. 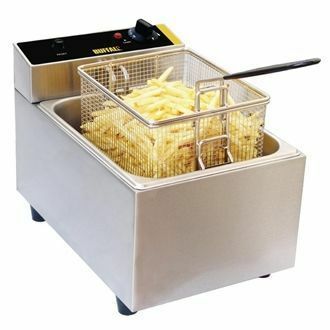 The large 5 litre frying tank is ideal for producing delicious and crispy fish, chips, chicken or doughnuts and once service is over the tank is easily removed for draining and cleaning. The Buffalo fryer also features a handy adjustable thermostat which allows precise temperature control for the best results, as well as an automatic thermal safety cut-off for safety - easily reset using the top-mounted button.